Oro Valley Home Sales July 2016 report for Single Family Residences (SFR) sold. Just click the link below to view the July’s Single Family Residences sales activity. Our Tucson Housing Report covers all Tucson Real Estate activity in July. Follow the month to month changes in the Tucson real estate market. Oro Valley, AZ continues to be one of the fastest growing communities in the greater Tucson area. New home communities are under way by National, International and Regional builders. These new home communities will be the last new developments in Oro Valley, AZ. Our Oro Valley home sales video summarizes the recent real estate activity in Oro Valley AZ. The Town of Oro Valley offers a great lifestyle. Community parks, aquatic center, golf course and endless activities.Take a quick video tour of Oro Valley – START HERE. Play Kim’s Oro Valley Home Sales July 2016 Video Update – NOW! For an authentic Southwestern experience Southern Arizona can’t be beat. The Sonora Desert covers this region with spectacular desert habitat. The giant saguaro is an icon of the American Southwest. Cactus forests blend with grasslands, riparian streams and mountain ranges. Oro Valley has attempted to strike a balance between population growth and environmental preservation. Oro Valley offers private country clubs, golf courses, hotels and resorts. It is one of the Southwest’s most affluent communities. 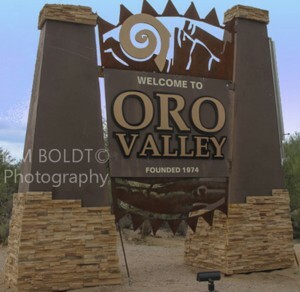 Oro Valley is a relatively new community founded in 1974. It has grown to 45,000 residents since that date. Oro Valley’s renowned winter season provides sunshine and sunset to remember. The ideal climate has romanced visitors for many years. In 2015, Oro Valley placed on 2 top ten lists for best places to live. Oro Valley is just 20 minutes north of Tucson AZ. Proximity makes the University of Arizona and its nationally ranked teams just minutes away. The numerous Tucson guest ranches provide visitors horseback rides and cattle drives. Small samples of the Old West that made Tucson and Oro Valley notable resort destinations. Five Mountain ranges surround the City of Tucson. Each mountain range is distinct. The Santa Catalina mountains are simply spectacular and a familiar sight for residents of Oro Valley. Many Oro Valley homes have stunning views of the Catalina Mountain and Mt. Lemmon at the peak. Mt. Lemmon is the southern most snow skiing area in the United States. Its dry climate and casual pace can be a natural setting are great to visit and a wonderful place to live. Oro Valley is a resort destination. Spas, resort hotels and championship golf courses abound. Oro Valley has long been recognized for community parks, recreational facilities and schools. Most of all Oro Valley offers visitors and residents a wealth of things to do and activities the year around. The Oro Valley home sales July 2016 is one of our eight monthly reports with the latest TARMLS trends in popular areas of Tucson. Furthermore, if you are considering a move to Oro Valley AZ or planning for a future place to retire in southern Arizona, we can help.